Others – Supply chain management, procurement, TQM, ZDM etc. The current position of an organization in the grid determines the future direction of the business. This position is determined by a thorough diagnostic of the industry & business analysis by using globally validated tools & frameworks. In an ideal world it is always considered prudent by organizations to keep growing and enhancing their performance. 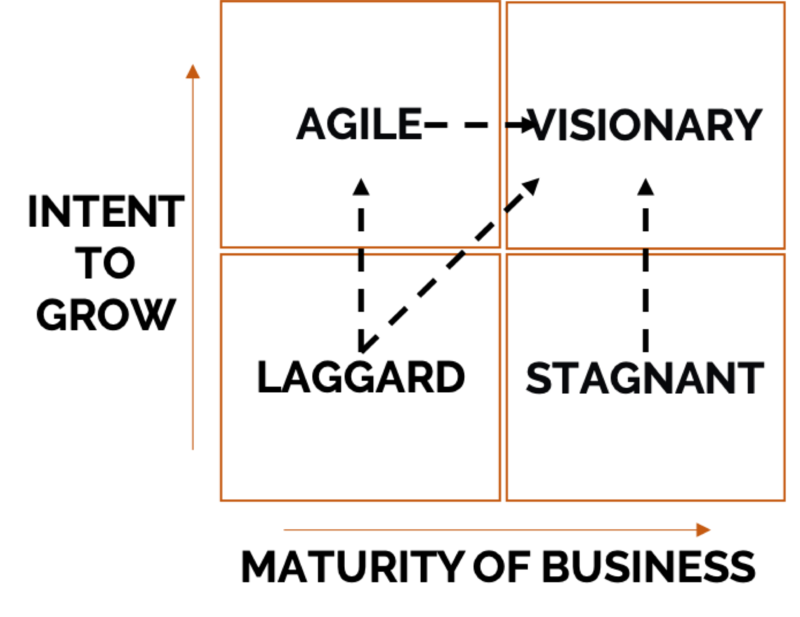 The dotted arrows represent the expected shift an organization should experience while on their way in developing a growth & transformation strategy. Recalibrate is a selection of global, conscious, mindful, multi-cultural professional business leaders, serial entrepreneurs and ivy league coaches that bring to the table several decades of global business, corporate and executive leadership experiences with some of the world’s leading organizations across geographies. We will enable your business to go from X to 2X and beyond. We will help you to convert these challenges into opportunities and we promise that “We will enable your company to reach unprecedent heights, that you may have dreamt off”. We are so confident of our promise that we will take majority of our consulting / execution fees, based on the results that we achieve for you. We have our own proprietary model of helping agile businesses and startups. We provide Business Transformation services in People , Sales, Finance & Technology engines through Advisory, Business Coaching and Innovation Mentoring.